- Dual Color Effect: White/Yellow. Able to change the color by touching its button on bottom. Quick response time of light. Either one single toggle(turn on) or two times to switch colors between yellow and white, and the third-time will turn it off. One simple round button, yet easy for all you friends use! - Dimmable: Put your finger on the Silver-disc button(USB Port)for seconds,you would enjoy dimmable effect. At full brightness, you can see the curves on this lamp vividly. When turn it off, uneven surface becomes much less detailed. - Rechargeable: On the top, there is a silver socket for charging or trun on/off. You will never have a clue that the socket has dual function. Up to 20 hours(depends on the brightness)as a night light! - Great Value: Fits for dark room incredibly when lit up. You must gaze at the Moon many times when you were a boy/girl. You must be wondering how's feeling to touch the Moon. 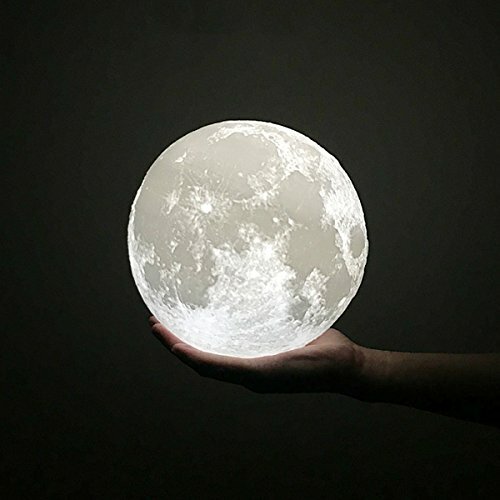 Just hold Our 3D printing LED moon light in hands, you might find it. Buy it as a gift or keep it yourself! *Check it carefully before use. *Place it on flat space. 3D Printing Technology: Employing 3D printing technology to print every single filament layer by layer, to perfectly reproduce lunar surface. Showing clear meteor crater and realistic mountains. Moon Lamp Design: Touch to change color and long press to adjust brightness. Soft lighting without disturbing glare or flicker. Using eco-friendly PLA materials, degradable and no off-smell. Lasting Life: Rechargeable lithium battery is included, charge for 2-3 hours, use 4-20 hours. Keep cool temperature even if long time lighting so that do not damage childrens' hands. Creative Gifts & Decorative Lights: Nice Gift for your kids, lover, friends, etc. Great to decor bedrooms, baby room, living room, bedside, college dorms, nursery, offices, party, etc. Small ornament to beautify your home or other places. Customer Guarantee: Any problems about your purchase or our lunar light lamps, are welcomed to contact us. We guarantee to meet you demand.